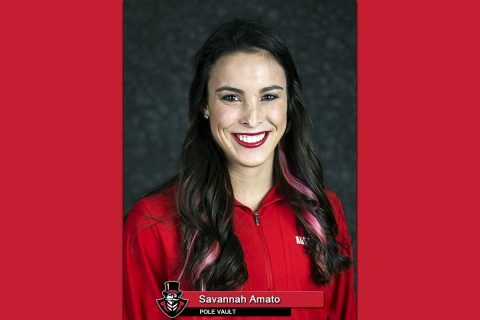 Brentwood, TN – Make it a three-peat for Austin Peay State University pole vaulter Savannah Amato, who earned adidas® Ohio Valley Conference Field Athlete of the Week honors for the third week in a row. Amato’s 4.17m (13-8.25) pole vault mark, cleared on her second attempt at the height at Saturday’s Hilltopper Relays where she finished runner-up, shattered APSU Athletics Hall of Famer Carrie Burggraf’s 2010 mark, giving the Delaware, Ohio native sole possession of both the indoor and outdoor school records. Overall, she’s been named OVC Field Athlete of the Week five times this season and eight times in her Austin Peay career. She’s the first OVC student-athlete to earn three straight Athlete of the Week honors since Tennessee State’s Amber Hughes, January 11th-25th, 2017 (one for field, two for track), the first to earn three straight field honors since TSU’s Clairwin Dameus (March 30th-April 12th, 2016) and the first Governor in recorded history with three straight honors from the league, sharing this week’s with Eastern Illinos’ Brion Portis. She’s the first Gov since Breigh Jones (2014-15) with five or more Athlete of the Week honors in the same season.